Includes: Headpiece, Jumpsuit, Mitts, Foot Covers. Lets bring more fighting spirit to your team with mascot outfit. We do love furry and cozy toys and we adore cozy mascot costumes too. Bringing more fun and giggles to your life is so easy these days with amazing Mascot costumes. Everybody loves a nicely dressed man. But Halloween is not about nice clothes. What do you say? Men loves to experiment with costume look every year. 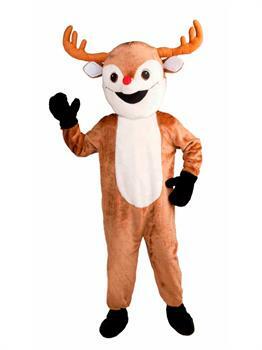 Travel to a new world of your imaginations with Reindeer Economy Mascot Adult costume.